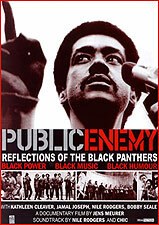 PUBLIC ENEMY presents four charismatic and influential Americans who have been leading wildly dissimilar lives, yet they have one thing in common: they are all former members of the Black Panther Party - the radical black liberation movement that confronted racial and economic inequality in 1960s mainstream America. A film about the revolutionaries after the revolution, PUBLIC ENEMY focuses on the personal lives, past and present, of four Panther Party members - prisoner-turned-playwright Jamal Joseph; musician and record producer, Nile Rodgers (Chic, Sister Sledge); law professor and lecturer Kathleen Cleaver; and the last surviving founding member, Bobby Seale. Through candid conversations, the promise and limitations of attempting revolutionary change are expressed: What were the Party's long-term effects on African Americans and their status in society? How did the Black Panther Party impact popular culture? How did these leaders' involvement personally affect them - their hopes, their dreams? And after tumultuous years of being viewed by the FBI as "the greatest internal threat to the nation," how does America perceive them today? Interlacing archival protest footage with recent interviews, the film examines black America today, 25 years after the demise of its most radical advocates. At a time when black culture - and the social gap between whites and blacks - is more prominent than ever before, PUBLIC ENEMY is a provocative interpretation of the dark side of the American Dream. A film about the League of Revolutionary Black Workers, which was, "in many respects the most significant expression of black radical thought and activism in the 1960s." - Manning Marable, Prof. of History, Columbia Univ.